I stopped over at Benji and Tionna’s house yesterday before Kennedy’s vet appointment so that he could play with Moxley and so I could see the girls! They were all wonderfully funny of course, and Tionna fed me one of their home made granola bars that was so delicious! Bonus factor- it tided me over because the vet appointment was right at my lunch time! The recipe, Benji says, is from the internet, but they don’t remember where. Preheat oven to 350 degrees. Grease a 9 x 13 inch baking dish. Mix together the first 7 ingredients, then make a well in the center and add the honey, beaten egg, the oil, and vanilla extract. Mix well. Pat the mixture evenly into the baking dish. Bake for 30-35 minutes or until the edges are beginning to turn golden. Cool for 5 minutes and then cut into bars and remove from pan while still warm. This entry was posted in General on July 20, 2011 by carolyngalizio. 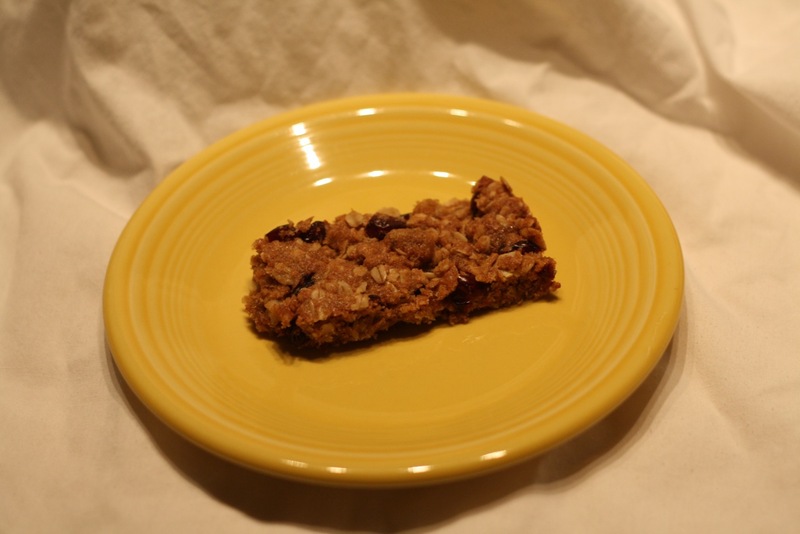 How does she find the time to make home made granola bars?! I’m impressed Tionna! Yes, I agree! And they were so delicious, too. The babies sometimes eat them for dessert, and Benji takes them in his lunch because he goes to work so early! I’ll add my voice to the chorus of amazement that anyone has the time to make granola bars, much less a mom trying to keep up with two toddlers! With classes starting up again these past two weeks, I barely have time to throw together a sandwich for lunch. Yummmmmmmmy. They look great. Can’t wait to see the girls again soon.